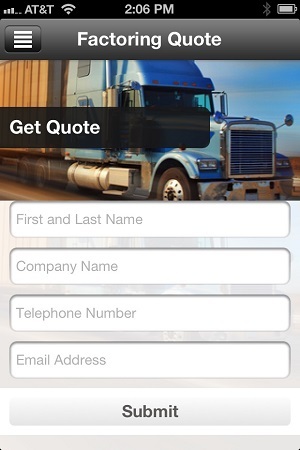 The freight factoring quote mobile application app is designed for truckers and freight brokers who are on the go and operate using mobile devices. The app is currently supported on Android devices. iOS support for iPhones is coming soon. 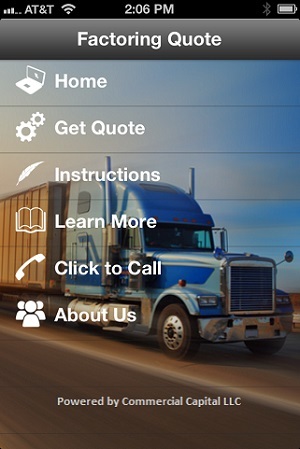 The freight factoring quote mobile app is intuitive and easy to use. To get a quote, select the “Get Quote” option from the main menu. This takes you to the application form. Please fill out your information accurately and select the “Submit” button to send the information to our systems for processing. You will receive an email with quote information promptly. The “Instructions” button opens a screen with information on how to use the app. But if you have any specific questions, you can select the “Click to Call” option to connect you to an operator who can take your quote information directly over the phone. Lastly, the “Learn More” button connects you to our resource center, which is full of information and useful industry articles. You can learn more about our freight factoring services on the product page or by visiting the freight financing resources area.